Co-ordinator of the International Campaign for Justice for Sankara. President Thomas Sankara was assassinated in Burkina Faso on October 15th, 1987. Twenty years later, his murderers remain in power and continue to reverse the revolutionary changes Sankara initiated. We interviewed Aziz Fall, the co-ordinator of the International Justice Campaign for Sankara (ICJS) who has been receiving ongoing anonymous death threats since December 2006. He has been co-ordinating 22 lawyers from France, to Senegal, to Canada, to Togo and beyond, dedicated to using legal means to find the truth behind Sankara’s assassination. This interview accompanies two articles about Thomas Sankara in the past and his legacy for today. It begins by first looking at the death threats, the ICJC and UN judgements. We then ask about some of Sankara’s achievements in terms of emancipation of women, education, and neo-colonialism in the 1980s, and then move onto questions about power, politics, and policies in Burkina Faso under President Blaise Compaoré who has been in power since Sankara's assination in 1987. Lastly, the interview relfects on Sankara’s legacy and his continuing relevance in this age of globalisation. Aziz, Can you please tell us the nature of the death threats? What do they say? Do have an idea of where they are coming from? Are they from the government? Third parties? Is it one person or several people etc? Thank you. I’ve received four death threats since December 2006. Three letters in bubble envelopes left in the mailbox at my front door. The first one was simple and said “stop or be stopped,” the second was similar but didn’t mention my name, and the third was a little more explicit, mentioning my name, asking me “to commit suicide or face execution.” I filed a complaint with the police in March 2007. Then, in April, after the screening of a film on Thomas Sankara in Montreal, a young Burkinabé journalist, Sam Kah, who appeared in the film, received a threat, according to the organising committee of the Thomas Sankara 20th anniversary commemorations. The committee had invited both of us to their activities which take place Oct 11-15th, 2007. Following the threat against Sam Kah, I decided to tell the committee members about my own death threats, which I had previously hidden from them because I was worried it would have a demobilising effect. They issued a press release concerning the threats against the two of us. A couple of days later, I received another threat, this time by phone. A man with a strange accent warned me that neither the police nor my lawyers would be able to protect me, and that since I still didn’t understand, my family would be targeted first, then me. At about this time, someone tried, unsuccessfully, to break into my home through the back door. This was discovered as we were installing an alarm system. We don't know exactly who is behind these threats. But we have good evidence that a Frenchman and two Africans have something to hide, because they have been caught in a number of lies and contradictions. The police and CSIS, Canada’s spy agency, are still investigating. That’s all I can say at this point. It is unacceptable that as an advocate of freedom and justice, I am being physically threatened in a country that promotes these basic values around the world. We have approached the Canadian authorities about this situation, and we have great hope that they will do everything to solve the matter. Can you briefly talk about the International Campaign Justice for Sankara (ICJS) and GRILA? How does the United Nations judgement (in which the Committee considers that the refusal to conduct an investigation into the death of Thomas Sankara, the lack of official recognition of his place of burial and the failure to correct the death certificate constitute inhuman treatment of Ms.Sankara and her sons, in breach of article 7 of the Covenant) affect the search for justice on behalf of Sankara? Sankara's widow, Mariam Sankara, and his two sons never abandoned their call to the international community to take action to bring his assassins to justice. Ten years ago, the Group for Research and Initiative for the Liberation of Africa (GRILA, an internationalist and panafricanist group) answered that call by creating an international campaign with a twofold strategy involving a political component and a legal one. I had the honour of co-ordinating a team of 22 lawyers, which put together a case for a full investigation into the murder of President Sankara and a dozen of his colleagues. The government of Burkina Faso, under the presidency of Blaise Compaoré, along with a highly compromised judicial system, blocked all efforts by the Campaign to bring the case to court. After exhausting all possible legal recourse within the country, the Campaign brought the case before United Nations Human Rights Committee. Just over one year ago, the UN Human Rights Committee ruled in favour of the International Justice for Sankara Campaign, and demanded that the government of Burkina Faso take action to shed light on the circumstances of Sankara's death. That was actually a world first, and certainly a legal precedent in Africa, creating a breach in the cycles of impunity that characterize the political life of our continent. There is also a link between the Sankara case and the trial of Charles Taylor, the former Liberian head of state, who plotted with Compaoré in the assassination of Sankara. We expect the final UN judgement to be announced later this year and really hope that it will represent a major step forward in the global struggle against impunity. What were some of Sankara's achievements, be it in the emancipation of women, education or rolling back neo-colonialism? Our organisation (GRILA) and the revolution in Burkina Faso are the exact same age and we have many things in common. So we may sound pretty subjective when it comes to our assessment of what was achieved in those three years. Sankara tried to put into practice most of the key elements of our own philosophy; among other things, the destruction of all forms of racism and ethnocentrism, with the Bambaata summit and the anti-apartheid struggle; the respect of collective and human rights; the struggle against regimes allied with imperialist interests; a balance between rural and urban incomes; food self-sufficiency; the fulfilment of basic needs. A key issue for Sankara was the political, economic and social emancipation of women and the transformation of sexist mentalities. That particular aspect was crucial in a very traditional society where sexism was so with entrenched. Men were invited to go to the market once a week, women were appointed to key State positions, and civic rights and the constitution granted women important advantages. While there were mistakes and contradictions due to the weakness of his alliances, Sankara was steadfast in focusing on other key issues as well, issues that are still cornerstones to our own work, namely, popular and civic participation, popular democracy and the promotion and empowerment of Africa's youth. Sankara promoted self-reliant, ecologically sustainable development, and invited locals and foreigners alike to plant trees; the emergence of regional panafricanist states that were politically and economically accountable to their citizens, as evidenced by his attempts to unite with Ghana. Sankara was committed to fighting corruption, and personally served as a very modest example, refusing to live a life of luxury and reigning in any tendencies by those within his government toward ostentatious consumption. Are some of these changes still visible or has the Compaoré government managed to erase all of them? While the Sankarist regime laid the ground for stability and a better form of development, it is clear that the international order ensured that Compaoré's regime did not take the same path. Compaoré’s regime was also involved in the Liberian and Sierra Leonean crises and wars, generating tremendous wealth for itself. The government has become very wealthy, which has allowed it to bribe some of the opposition elite, while intimidating or killing others. Within the framework of the neo-liberal agenda and the French zone of influence among its former African colonies, the regime has been able to establish a formal democracy and to reproduced itself, and in so doing has widened the gap between the haves and the have nots. Compaoré has recently amended the constitution so that he can run for a third term which means he will have been in power from 1987 to 2012. A very common phenomenon in Africa indeed. It's a pity, but history will judge. Killing your comrades and opponents and tailoring the constitution to fit your needs is nothing new. Even if the population is frightened, and busy surviving the harsh conditions of unequal development, there is no doubt that one day it will rise up against this. 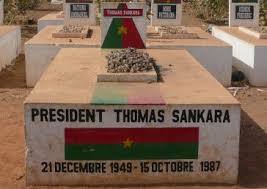 How do the people of Burkina Faso regard Sankara today? Is he still part of the political imagination? We'll see how the population will react on October 15, but it is clear that Sankara is going to be celebrated in many countries this year, which has been named Sankara Year by his supporters. That is surely a great sign of vitality and political imagination! How does Sankara challenge the idea of revolution today? What is his legacy? What is his continuing relevance in this age of globalisation? I think that GRILA is living proof of that legacy, and that the struggle that is at stake, in this process of so-called African union and various attempts at integration, has to consider what we are still advocating, namely: democracy and progressive strategies that focus on self-reliant and popular development. Africa should rely more on its own forces, within a socialist and panafricanist perspective, and develop strong ties with other third world countries. This form of development entails subordinating external demands to internal needs. A consciousness that is increasingly homogenised by the dominant values of today's globalized world system, however, is incapable of envisaging such a path. As the Burkinabé revolution was trying to achieve, GRILA's task as well as that of any other progressive political force in Africa, should be to contribute to re-politicizing the discussion around development, fostering a new political consciousness, and channelling the efforts of an organic intelligentsia that will be capable of building an alternative to the disorder now ravaging Africa. How are these challenges being addressed today—locally and internationally? For us it is important to continue the work. We will not be intimidated. Locally the Sankarist movement, despite numerous factions, is more united and better organized. In many African countries and in the Diaspora, Sankarist clubs and associations are mushrooming. A lot of people expect that history will repeat itself in a cyclical fashion. But each society is confronted with new challenges, and will take different roads. It appears to me that as long as the contradictions of capitalism deepen, and societies continued to be destroyed by the capitalist way of life and production, we have no choice but to invent more progressive and internationalist paths in order to tackle the barbarism of globalisation and the forces that dominate it. In April this year, we celebrated 50 yrs of Ghana’s Independence. In October, we are marking the 20th year since Thomas Sankara’s assassination – a stark reminder that we are still in the state Odinga Oginga called Not Yet Uhuru. We will be remembering that if Africa suffers today, it is because yesterday its best political minds, and its most fiery and committed sons and daughters were assassinated. All for thirty pieces of silver, for tea, coffee, oil, diamonds, gold, cobalt, uranium and African sweat. But we should also remember the living. Aziz Fall, the co-coordinator of the International Justice Campaign for Sankara (ICJS) has been receiving anonymous death threats since December 2006. They tell him “stop or be stopped” “commit suicide or face execution” and in the last one, he was informed that his family would be targeted. His crime? Coordinating 22 lawyers dedicated to using legal means to find the truth behind Sankara’s assassination. The ICJS helped Mariam Sankara, Thomas Sankara’s widow, take her case to the United Nations after, predictably, the legal system in Burkina Faso stalled each time she appeared in court. Finally, in March 2006, the United Nations Human Rights Committee ruled that Sankara’s family has “the right to know the circumstances of his death.” The Committee also argued that failure to correct the natural death entry on Sankara’s death certificate, refusal to investigate his death, and “the lack of official recognition of his place of burial” pointed to “inhumane treatment of Ms. Sankara and her sons” contrary to Article 7 of the International Covenant on Civil and Political Rights. Dictators and your torturers all over the world take note! Article 7 declares: “No one shall be subjected to torture or to cruel, inhuman or degrading treatment or punishment.” In a strange way, the death threats against Aziz further validate the UN ruling. Victoria Mxenge, Ruth First, Steve Biko, Amilcar Cabral, Samora Machel, Chris Hani, Mhodlane, Kimathi and many others dead at the hands of colonialism and apartheid. But what makes the assassinations of Sankara, Lumumba or Maurice Bishop of Grenada all the more painful is knowing that they were betrayed by those closest to them. And their successors are egregiously guilty of violently pulling back their societies miles behind the starting line. After Lumumba, Mobutu –a common thief who under the guise of a shallow nationalism - maimed, killed and stole in the Congo. In Grenada, Bernard Coard’s bloody counter-revolution allowed a predatory U.S. to invade Grenada. And in Burkina Faso, each day we see what President Blaise Compaore has done with the Sankara revolution. Life expectancy is 47.9 years, adult literacy, 21.8 percent and Burkina Faso now has the dubious distinction of being ranked the 3rd poorest country in the world with 80 percent of its 13 million people living on less than two dollars a day. In November of 2007, Compaore will be running for presidency, again. I say give him five more years to see if he can do it – Let him get Burkina Faso the coveted first place title of poorest country in the whole world! For a nation to heal, it must know and come to terms with the truth of its past. And it must make good with the promise of that past. In 1957, Kenya’s Dedan Kimathi was hanged and buried in an unmarked grave in Kamiti Prison by the British, where the post-independence government left him. Having set Kenya on neo-colonial rails and rewarded the collaborators with land, then turned their backs on Mau Mau veterans, both Kenyatta and Moi wanted what Kimathi stood for forgotten. Compaore is afraid of the truth because Sankara is a reminder of how far he has fallen from the promise of the revolution. Compaore knows we know he cannot make good on Sankara’s promise. We have to remember our dead. But our presidents prefer gold monuments and statues. Sometimes they cultivate heroes’ acres without growing freedom. Better the monument be societies that are free and egalitarian. Instead of grand monuments, it is better we have nations that would welcome the revolutionary dead. Because truth be told, Nkrumah would not have been welcomed to Ghana’s 50 year celebrations. Kimathi would not be welcomed in today’s Kenya and Sankara would be assassinated again in today’s Burkina Faso. As we remember our dead – Let us also remember the living. We have to dare to remember the past. We have to dare to dream again. But also, let us dare to act. Mukoma Wa Ngugi is the author of Hurling Words at Consciousness (AWP, 2006) and Conversing with Africa: Politics of Change (KPH, 2003), and editor of the forthcoming, New Kenyan Fiction (Ishmael Reed Publications, 2008). He is a political columnist for the BBC Focus on Africa Magazine where this essay first appeared.